Let me preface this blog post by saying that I am obsessed, OBSESSED, with magazines. I know that between magazine websites and sites like Pintrest magazines might be a little outdated, but there is something so relaxing about being able to sit down with a magazine with all the pretty layouts, a cup of tea and my favorite blanket and being unplugged for a while. Last year I got to the point where I had so many magazines that I was literally filling storage bins with them. I couldn’t throw them away because they had a craft I wanted to try, or a recipe I needed to work into the rotation, etc. etc. I knew I had to reduce the clutter, especially since so many of my magazines are home magazines that preach organization and decluttering, but I didn’t know how. My solution: a magazine binder! Since I am almost equally obsessed with office supplies, this was a perfect solutions. As I flip through each magazine I cut out my favorite pages and they go into my binder(s), which is divided into categories. What can this possibly have to do with Test Kitchen Thursday you ask? Well, recently I had to move my ‘recipes’ section into its own three-inch binder. I have already tried a lot of them out, but I think the majority of these recipes will end up coming from magazines, since they often add some unique flair or technique and I really want to learn how to actually cook, not just replicate a recipe. 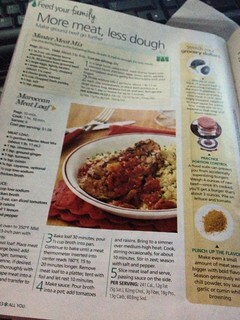 For example, this particular recipe (from the January 2013 issue of All You magazine) uses a meat mix that you can make ahead of time, and then use in three different recipes: Moroccan Meat Loaf, Beefy Calzones and Tamale Pie. I think this is a brilliant idea and something I never would have thought of. I only wish they would have called it something other than ‘master meat mix’ because I called it mystery meat mix more than once and that is, well, less than appealing. My biggest obstacle in making a menu for the week is that when I plan it, I have no idea what I am actually going to be in the mood for three days later. With the type of recipe, there is more flexibility in your menu and I really like that. On to the recipe! 2. Divide mixture into 2 portions, about 1 lb. 11 oz. each. Use immediately or place each portion in a large zip lock bag, squeeze out air and seal. Refrigerate for up to 1 day or freeze for up to 1 month. 1. Preheat oven to 350°F. Mist a 9-by-13-inch pan with cooking spray. 2. Make meat loaf: Place meat mix in a large bowl; add cinnamon, ginger, turmeric, cumin and cayenne, if desired. Mix gently but thoroughly with your fingers. Shape meat into a 5-by-7-inch loaf and transfer to greased pan. 3. Bake loaf 30 minutes; pour 1/2 cup broth into pan. Continue to bake until a meat thermometer inserted into center reads 160°F, 15 to 20 minutes longer. Remove meat loaf to a platter, tent with foil and let rest 10 minutes. 4. Make sauce: Pour broth into a pot; add tomatoes and raisins. Bring to a simmer over medium-high heat. Cook, stirring occasionally, for about 10 minutes. Stir in zest; season with salt and pepper. 5. Slice meat loaf and serve, passing sauce on the side. Overall I thought this was a really good recipe and I will definitely make it again. I am not a huge fan of onions so I wish I would have scaled down the amount a bit in the meat mixture, but they gave it a good flavor. I also decided to skip the cayenne in the meatloaf and the raisins in the sauce. I think they probably would have added an interesting texture to the sauce, but I just couldn’t get my mind around the tomato/raisin combination. I plan on making the Tamale Pie with the other half of the meat mix, so we will see how that turns out. What new recipes have you tried lately? Leave a comment, or let me know on Facebook or Twitter!